I’m a sucker for a good book. And thanks to the free Amazon Kindle Reading app, I have access to thousands of books across all my devices. This means I can read a best-seller while waiting in line or re-read a treasured favorite on a Friday night from my phone, tablet or, you guessed it, my Kindle Fire. But more likely than not, I’m reading tons of non-fiction ebooks. Specifically, ones that inspire me as a blogger, solopreneur, and mom. In fact, it’s in the virtual pages of these ebooks that I’ve learned how to grow an online presence and keep persevering, even when the going gets tough — you know, become a bona fide girl boss in the making! You could probably use a little inspiration every now and again too. I mean, who couldn’t? So, without further ado, here’s a list of 7 of the most inspiring girl boss books I’ve read (so far). In their pages, I hope you find the same motivation and meaningful advice that will awaken your inner girl boss and spur her into unstoppable action! 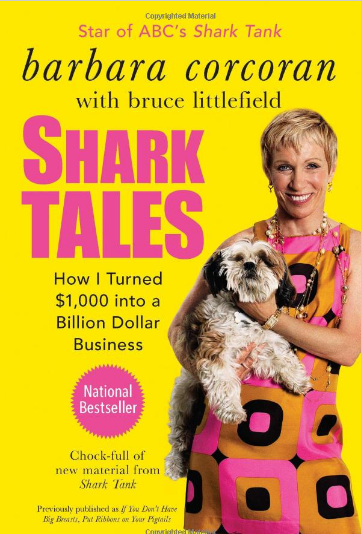 Even if Shark Tank wasn’t one of my favorite shows, I’d still be singing the praises of Shark Tales, a spirited book on entrepreneurship by Barbara Corcoran. True, this book isn’t geared to women in particular but reading Barbara’s personal stories and her take on business is sure to be motivating for any aspiring girl boss. For being a heavy-hitting business book on how she turned $1,000 into a billion dollar business, it was actually a light, enjoyable read. In fact, I devoured this entire book in just a few nights. Barbara’s personal anecdotes as well as life lessons learned from her mom (i.e., offer the bigger piece and yours will taste better), helped keep things entertaining. But in true Barbara fashion, this book is filled with plenty of no-nonsense, actionable advice for budding entrepreneurs. If Barbara can quit her job as a waitress at 22 and parlay a grand into a billion dollar business, you can too! We’ve all been told to “man up” at some point in time when there was a task ahead we did not want to do. 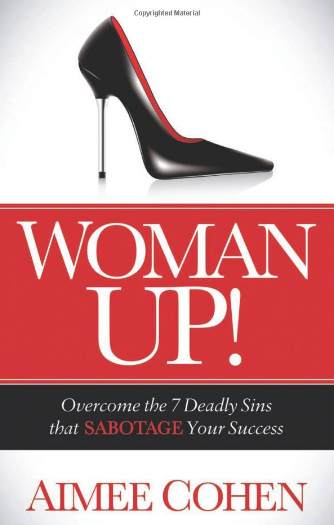 And now Aimee Cohen is taking that message directly to women with her insightful career book, Woman Up! This is a must-read for any girl boss who needs a little extra push to take their career into their own hands — and that’s exactly what it did for me! Honestly, I wasn’t even sure this book was for me. After all, I wasn’t looking to climb the corporate ladder. Still, Aimee’s personal stories of success (and failure) helped put things in perspective for me as a solopreneur and freelancer. And learning the 7 deadly sins that sabotage success (which I was guilty of ALL of them), helped me overcome self-doubt and fear of failure. Wherever you’re at in your career and regardless of the path you want to take, Aimee will show you how to get there. Last year I was struck with a bout of the flu that rendered me useless for an entire week. And while I felt like I got ran over by a mac truck, there was one good(ish) perk: Being able to catch up on reading! 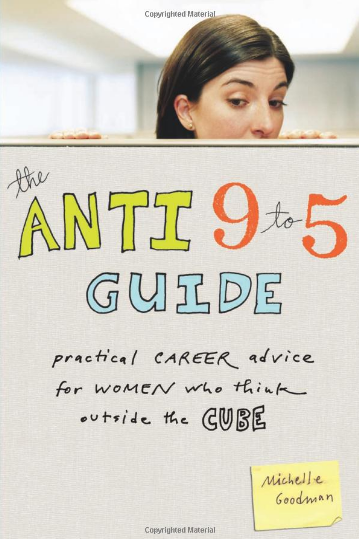 That’s when I stumbled across and feverishly read The Anti 9 to 5 Guide by Michelle Goodman. Maybe it was the 102-degree fever at the time, but I swear the words on the page leapt out at me as if Michelle was my best girlfriend sitting there dishing out the best pep talk of my life. If you’re looking to escape your cubicle, I think you’ll find it to be equally eye-opening (no fever required). After all, not all women want to climb the corporate ladder or get that corner office. Michelle gets that. 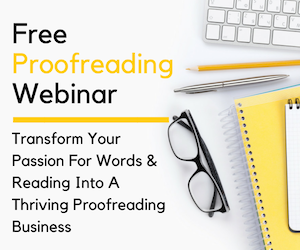 And she’ll show you how you can pursue your passion outside of your day job without going broke — win, win. There’s a growing movement of mothers who want the best of both worlds — to stay at home with their families and bring home the bacon. And why not? We really can have it all, right? 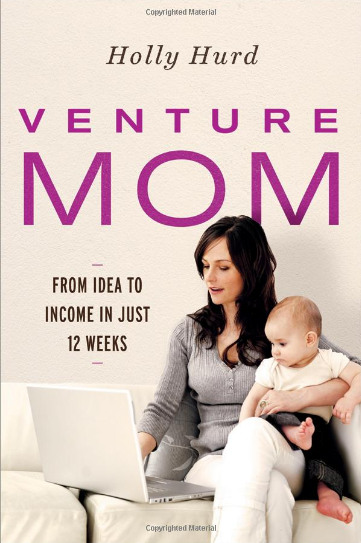 According to Venture Mom by Holly Hurd we can. And she’s showing other would-be mompreneurs how to take the leap from stay-at-home parent to home-based startup. 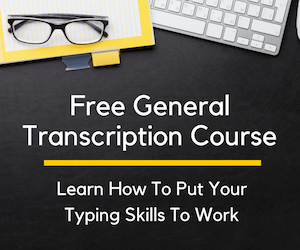 I know that sounds like a tall order to fill but Holly breaks it down into manageable chunks that can be completed over the course of 12 weeks. This is the perfect step-by-step guide for moms to pick a profitable idea and get it off the ground — quickly. And don’t worry, there’s plenty of stories of success and helpful tips to push you through to the next step even when you feel like giving up (been there, done that). 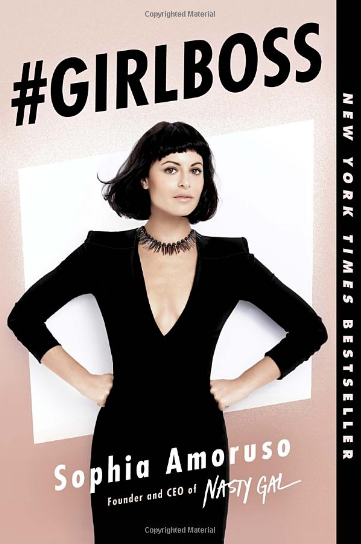 No girl boss booklist would be complete without mentioning #GirlBoss by Sophia Amoruso. A #girlboss herself, she shares what it was like to break free from a job she took only for the health insurance to in order to pursue entrepreneurship. Granted, Sophia took an unconventional path to entrepreneurship by way of petty theft and dumpster diving. But in the end, she opted for a mainstream business: selling vintage clothes on Ebay. Fast forward a few years where she found herself the founder and CEO of Nasty Gal, a huge, multi-million dollar online fashion retailer. Before reading this book, I’ll admit, I had no idea who Sophia was. But now, I’ll never forget her. The stories she shares are funny and thought provoking. If you’ve got a girl boss deep down inside of you, Sophia will pull it out of you, no matter how winding, exhausting, or strange the journey may be to set her free. I used to have this false belief that, in order to be a successful girl boss, you had to be perfect. There were no mistakes and you were effortlessly flawless in all things you did. Boy, was I wrong. And I credit Girl Code by Cara Alwill Leyba for showing me the light. Cara so brilliantly discusses how breakdowns and missteps contribute to our success and how building a community of like-minded girl bosses can make us all better entrepreneurs. Because what’s good for the goose is good for the gander, right? Right! 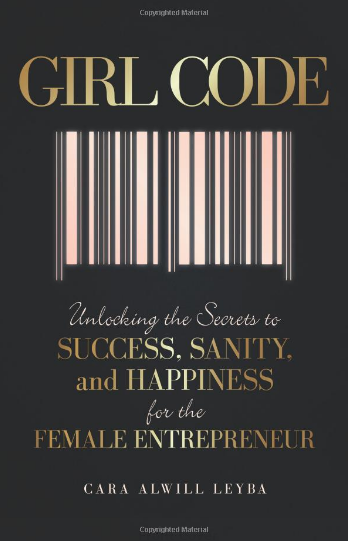 But seriously, this book was truly enlightening and personally helped me breakthrough some of my own misconceptions about being a female entrepreneur. And if you’re a side hustler, solopreneur, blogger or anything in between, you’ll appreciate the roadmap laid out in these pages that will help you achieve happiness and self-confidence all while building a supportive network of fellow girl bosses! 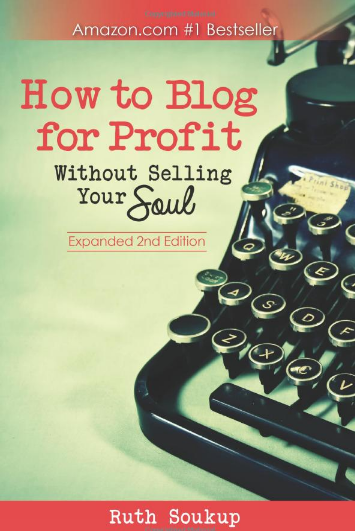 I know not all girl bosses are bloggers (or even want to consider blogging), but I just had to share How to Blog for Profit: Without Selling Your Soul by Ruth Soukup on this list! 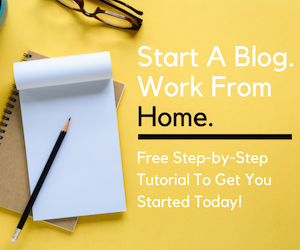 This was one of the many, many blogging books I read while launching Work from Home Happiness. And, hands down, it was the one that resonated with me the most and proved to be the most valuable! 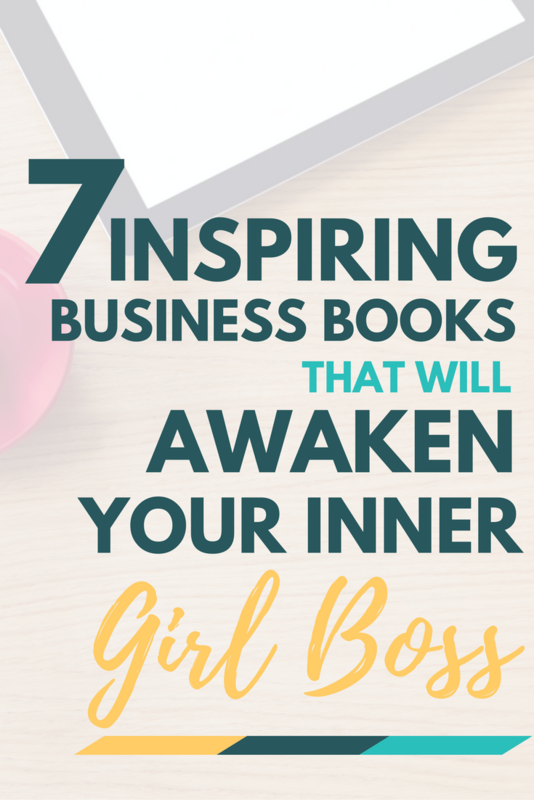 There you have it, 7 incredible and inspiring books to awaken the girl boss buried inside of you. Whether you’re already launched or thinking about it, these books can serve as a source of inspiration and support as you make your way through the world of female entrepreneurship. Tell me — have you read any of these? Is there another title you love that I missed? Share your thoughts in the comments below! P.S. All of these books are available in ebook format and can be purchased through the Amazon Kindle Store . If you don’t have it already, download the free Kindle Reading App so you can start devouring these (and thousands more) books across all your favorite devices. This post contains affiliate links. I only recommend products, services, and brands I know and trust. Learn more about my use of affiliate links by reading my disclosure statement. Passing this along. Have a great day and weekend! Delighted with these books, thanks so much for these wonderful resources. Awesome addition 😉 Thanks for suggesting it!